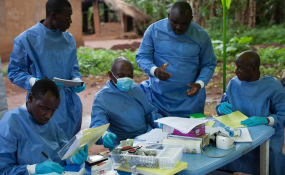 Ebola Outbreak in DRC - Are We Better Prepared This Time? An Ebola vaccination team (file photo). Scaling up in response to the Ebola outbreak in the Democratic Republic of the Congo, UNICEF, with the DRC Government and partners, is mobilizing hundreds of community workers to raise awareness among children and families of how to protect themselves against the disease. The community workers will also play a crucial role in providing communities with information on the Ebola vaccination campaign, planned to start next week. The community workers, deployed to Bikoro and Mbandaka health zones, aim to help contain the spread of the outbreak through information campaigns, social mobilization and community engagement, including disseminating information through radio, religious institutions, markets, schools and youth associations. In addition to public information campaigns, UNICEF has provided supplies for water and hygiene, including water purification tablets to the Ebola Treatment Centers and communities in Bikoro and Mbandaka, and installed disinfection points in four further health facilities. Hand-washing points have also been installed in 50 targeted schools in affected areas in Mbandaka, and an additional 72 schools in Bikoro will soon receive hand-washing equipment. Schools are being equipped with thermometers to monitor the health status of children. â€œWe will do everything we can to make schools safe and ensure that childrenâ€™s education is not disrupted,â€ said Dr. Rotigliano. Since the declaration of the Ebola outbreak by the Minister of Health on 8 May 2018, UNICEF has deployed 4585 kg of supplies, including soap, tarpaulins, buckets and chlorine to support water, sanitation and hygiene activities. Some 80 metric tons of aid, including health and water, sanitation and hygiene supplies are being shipped from Sierra Leone to the DRC to support the response.